Not too long ago, Imran Khan had actively supported the violent protests against the Nawaz Sharif government. Blasphemy accused Asia Bibi’s acquittal and final release, after more than nine years in prison, by the Supreme Court has plunged Pakistan into chaos. The Tehreek-e-Labbaik Pakistan, a Barelvi group led by cleric Khadim Hussain Rizvi who is known for his extremely profane language and the 22-day long Faizabad Dharna of 2017, mounted protests in every major city to oppose the verdict. In video messages, the TLP leaders called for murder of the three judges on the bench that acquitted Asia Bibi, and urged Muslim generals to rebel against the ‘Qadiani’ Bajwa, a derogatory term for Ahmadis, and oust the ‘Jew’ Imran Khan. It has been a long wait for Asia Bibi, a poor Christian woman who worked as a farm picker in Nankana, Punjab. She was accused of blasphemy and swiftly imprisoned in June 2009. In 2010, a trial court convicted her and handed out death sentence for disrespecting Prophet Muhammad. Mother of five young children, she has languished in prison since then. Her appeal was rejected by the Lahore High Court in 2014, but she finally got justice from the Supreme Court Wednesday. Asia’s case gained international spotlight because of Pakistan’s human rights record. Just this year, the European Union tied trade access to her case. The protests turned into grotesque rioting and arson. Schools had to shut down and many children in different cities were stuck because half of the roads were blocked by the TLP and the other half by local police. In Karachi and two other cities in Sindh, the violence snowballed into Shia-Sunni fight with two dead in Karachi by night. Government ministers and Pakistan Prime Minister Imran Khan remained conspicuous by their absence the entire day. Clerics of other religious parties joined the chorus with all the Deobandi, Ahle Hadees, and Barelvi groups denouncing the judgment and announcing that they will join the protests Friday onwards. These groups were joined by two major religio-political parties, the Jamiat Ulema-e-Islam (F) and the Jamaat-e-Islami. There was no statement from the military or its Twitter-happy spokesman either. Media had been given instructions the previous night on ‘no coverage’ of any protests – and it complied. There was a complete media blackout in Pakistan for the last 48 hours. However, social media was flooded with details. At nightfall, finally, PM Imran Khan addressed the nation. Within two months of coming to power, his five years of politics of dharna, incitement to violence, blasphemy campaigns, civil disobedience, disruption to traffic and closing down of different cities had come to bite him back. He first appealed and then threatened the TLP for its actions. Not too long ago, Imran had actively supported the TLP’s violent protests against the Nawaz Sharif government. Social media reacted immediately, putting out clips of Imran and his ministers’ past videos of violent speeches, incitement to violence, and their supporters rampaging the Pakistan Television building and Parliament. They asked: Has all this dawned on you only now because you are PM? Next came the video of President of Pakistan Arif Alvi. A year ago, he too was on the roads of Karachi saying, “sara karachi band hoga, koi gari nahi chalaygi”. 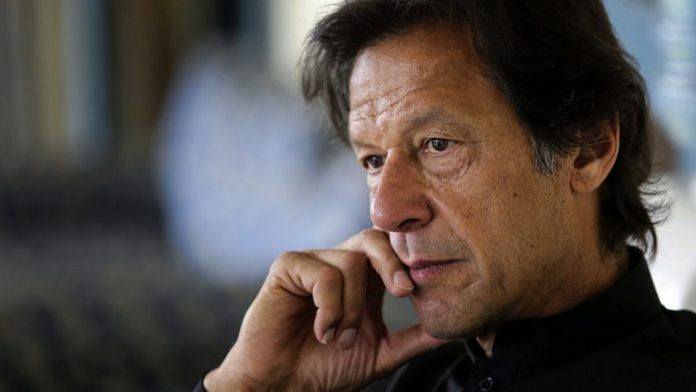 Ironically, Imran Khan in his seven-minute address to nation Wednesday said exactly what his government was trying to hide from the Pakistani public. In the video, the PM ended up saying what the TLP leaders had been saying all day, the things that the media had blacked out: that General Bajwa was a ‘Qadiani’ and the army should rebel, and that protesters had called for the murder of the judges. But interestingly, Imran Khan skipped any mention of him being called a ‘Jew’ and demands for his ouster. After going MIA the whole day, Imran Khan was now threatening use of force and promised protection of life and property. But even after his speech, violence, loss of life, mayhem in schools, colleges, and markets continued all night and well into Thursday. At the time of writing this piece, the situation remains volatile with one more death reported on the Lahore-Islamabad motorway. The politics around the issue of blasphemy that Imran Khan used incessantly during his days in the opposition has now turned into the proverbial Frankenstein’s monster. His opposition politics was clearly supported by the establishment then – clear from the way the army chief refused to come to the aid of government to control the TLP in 2017, and how a military general distributed money among the goons at the end of the ‘protest’. Imran’s opposition politics inevitably emboldened these radical voices. At that time, all the sane voices had warned against this fire of dangerous politics – but none heeded. But the fact that it would come back to haunt the nation so soon was entirely unexpected. A reading of the historic judgment by the Supreme Court vindicates everything that human rights campaigners have asserted for years: that she was falsely accused and it was a malicious suit arising out of a dispute between a Muslim farm picker and her. The fight was over the Muslim woman refusing to drink water brought by her because she was a Christian. None of the earlier judgments had focused on the dispute itself, overlooking the countless holes and contradictions in the prosecution’s case. Justice Asif Saeed Khosa went far enough to say that the Muslim women committed blasphemy by disparaging Asia Bibi’s religion, book and God. For the first time any member of the legal community, no less a judge, has not only focused on this point, but also made it a part of his judgment – a point I had made in my article in 2011. While we heave a sigh of relief over the verdict, Pakistan risks burning in the fire of religious hatred, use of religion for politics, and the clear prospect of sectarian wars. The author is a columnist and human rights defender based in Lahore.